Poster Day (April 10th, 2014) is filling up fast! If you are a third year and you have yet to complete the Poster Day event registration is urgent and if you are close to thesis completion registration is even more urgent. If you are a second year or you will be a second year by April 2014 then you should also register in Liverpool Life as soon as possible. There are only 260 places available for Poster Day in the CTL so its important that you register now. 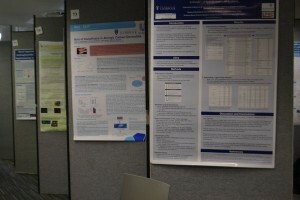 Poster day 2013 was a great event – make sure you don’t miss out in 2014!